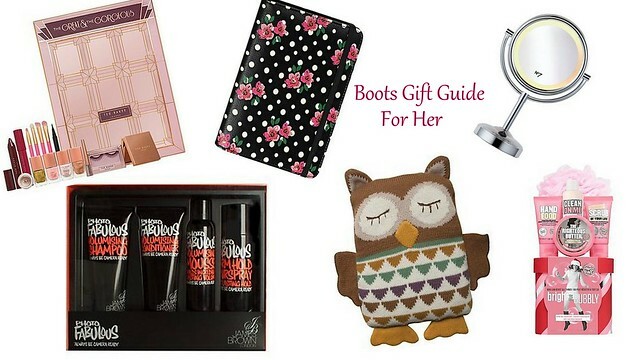 With Christmas coming I've decided to do a little series of posts sharing some gift ideas for him and for her. The first one i've created is all things for her from Boots. I love shopping at Boots around Christmas time for the simple fact that 3 for 2 is a life saver! This is the perfect gift for any makeup lover! My mum had actually bought me this for Christmas as last week it was Boot's Offer Of The Week. This includes brushes, nail varnishes, eyelashes, lip crayons and more! The packaging is so cute and girly that it's perfect for all ages. I got this for £19 but I think it's now £40. How cute is this!? I love anything floral and with the inclusion of polka dots i'm sold. I think Kindle covers are the perfect girly gadget, especially if you know someone is getting a kindle already. At £20, it is quite pricey but as it's part of the 3 for 2 Christmas gift sets it's pretty darn good. I love this mirror, I think it's the perfect gift for any beauty lover and I know that i'd love to receive this. It would look gorgeous on a dressing table and would come in really handy for those dark, winter mornings. This is also reduced to £19.99 so get it while you can! I don't think i've ever had a Christmas were I haven't received a hair care gift set! I love the packaging of this, it's so different. This would make the perfect stocking filler or secret santa present. At £20 it contains everything you need to have the best hair day ever! We all have that person in our life who loves being warm and snuggly. This gorgeous owl teddy is perfect for them. Not only is it cute and cuddly but it's also microwavable meaning that you can always be warm! This is perfect for all ages, I know little girls that would love this like my niece but my older sister would also love it just as much. Ah Soap & Glory! Who doesn't love a Soap & Glory Christmas set. I chose this gift set as I think it has the perfect products for beginners but it also has the classics for those who have been a lover for years. It's only £10 so again perfect for a Secret Santa present. Have you started your shopping yet? Would you like to see more shop related guides or ideas from lots of shops? I loveeeee it when the Boots Christmas Guide comes out! Your fave picks are so cute!! I got the Number 7 mirror last year and its my life saver for doing my makeup in winter and for shaping my brows!